One of the Three known Abalone without Holes. Found in San Quintín, Baja California, Mexico, 1987. Photo: Buzz Owen. Since abalone are defined by their row of respiratory pores on the shell it is of course quite interesting that some individuals have been found that do not have them! These abalone, called imperforates, are extremely rare and only three are known for certain, all black abalone (Halotis cracheodii). A recent scientific paper published by Buzz Owen, Dave Leighton and myself (Owen et al., 2015) describes these rare and unusual abalone. The first was found near Los Angeles, California in the early 1900s, is 3.9 inches (100 mm) in length, and is currently in the National Museum of Natural History (the Smithsonian) as the type specimen for form imperforata of the black abalone. The second individual was a freshly dead juvenile found in a tide pool at Johnson’s Lee, Santa Rosa Island, California, in August 1964 by Chuck Snell. It measured 1 inch (26.5 mm) in length. I found the third specimen alive in the intertidal zone at San Quintín, Baja California, Mexico, in July 1987. It measures 3.4 inches (86 mm) in length and was held for 8 months in the lab at the Hatfield Marine Science Center before it died. All are illustrated on the plate below along with a typical black abalone (with pores) at the bottom for comparison. All known imperforate abalone (top three rows) shown next to a typical black abalone with pores (bottom row). From Owen et al. 2015. There are other abalone that have been found with no holes but a true imperforate abalone is unique in that it never had holes at any stage in its growth, which you can see from the side view on the shells above. A fourth imperforate, a 0.3 inch (8-10 mm) juvenile red abalone (H. rufescens) found alive at Pacific Beach, California in 1959 in a giant kelp holdfast, was found by Dave Leighton (1960). This is the only case where the soft body was available to show the complete absence of the pallial cleft: No cleft — No holes !! There are other abalone, primarily blacks but also red and green (H. fulgens) abalone, that also lack pores as result of damage to the shell. But because they possessed holes at an earlier growth stage they are not considered true imperforates. A black abalone without holes that resulted from damage to the shell. Collected on Santa Cruz Island, California by Brian Tissot in 1988. Holes were visable on the early growth stages of the shell. Photo: Buzz Owen. 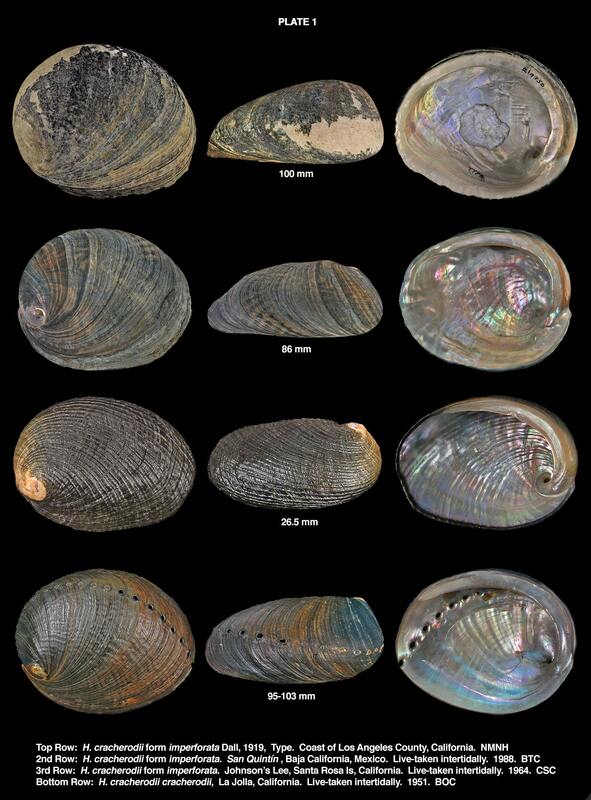 If you are interested in this topic I suggest you read the paper we recently published in the The Festivus on these rare abalone, which also discusses their adaptive significance and possible origins. Additional information and photos of imperforates is also found in the great big abalone book by Daniel Geiger and Buzz Owen (2012). In writing The Festivus paper I was truly honored as the junior scientist to work with two distinguished abalone scholars such as Buzz Owen and Dave Leighton. They are the true Drs. Abalone in my book. Collectively the three of us have over 160+ years of abalone experience (Buzz since 1949, Dave since 1957 and me since 1977). Dr Abalones: Buzz Owen (left) and Dave Leighton (right. Geiger, D. L. & B. Owen. 2012. 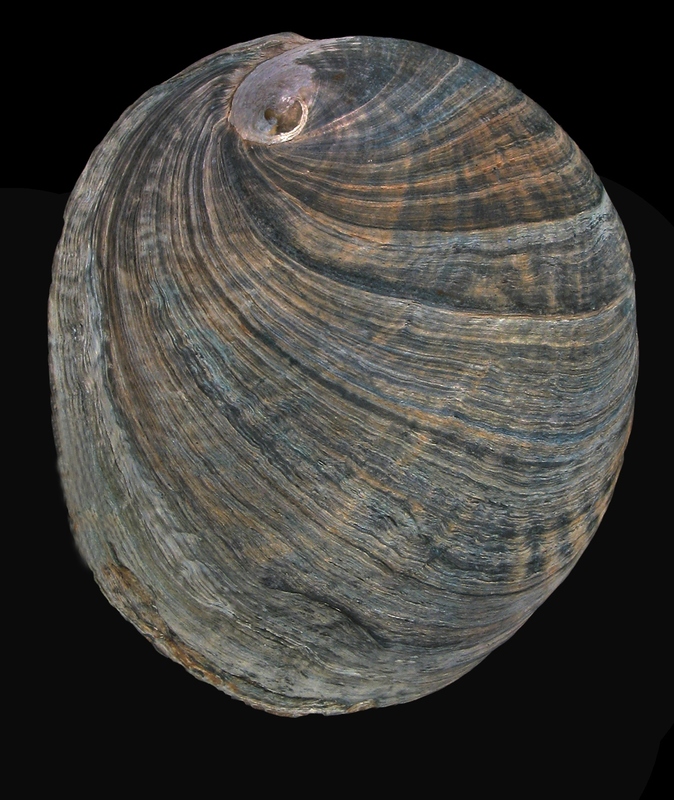 Abalone – Worldwide Haliotidae. Conchbooks, viii + 361 pp. Leighton, D. L. 1960. An Abalone Lacking Respiratory Apertures. The Veliger 3(2): 48-49.